POP! CARDBOARD 3.0 + FREE Head Strap. Made in Germany Inspired By Google Cardboard 2.0. 3d Glasses Virtual Reality Viewer for Any Smartphone / Mobile (Android Samsung S5 S6 Apple Ios Iphone 6 Plus). On Set Including Lenses. No Kit, No Assembly: Fold It up and Get Started! Mega Sale! Save 27% on the POP! CARDBOARD 3.0 + FREE Head Strap. Made in Germany Inspired By Google Cardboard 2.0. 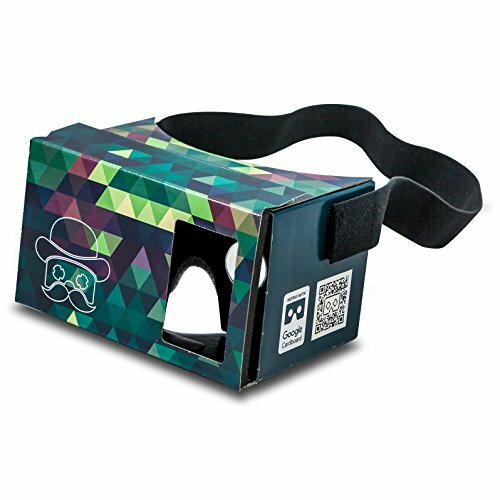 3d Glasses Virtual Reality Viewer for Any Smartphone / Mobile (Android Samsung S5 S6 Apple Ios Iphone 6 Plus). On Set Including Lenses. No Kit, No Assembly: Fold It up by MR.CARDBOARD at Home Entertainment Centers Online. MPN: 31337. Hurry! Limited time offer. Offer valid only while supplies last. After the huge success of POP! CARDBOARD, we took your feedback to heart and continued to develop the next iteration of POP! CARDBOARD. After the huge success of POP! CARDBOARD, we took your feedback to heart and continued to develop the next iteration of POP! CARDBOARD. GOOGLE CARDBOARD WILL EXCITE YOU! Together with your Android or iOS mobile phone, the 2.0 Google cardboard app is your ticket to a virtual reality 3D world. Start the app or a video and put your smartphone in POP! CARDBOARD. For each eye, a separate, slightly different picture is shown on the display. This is how the 3D effect is created, so you can enjoy your very own 3D experience! If you have any questions about this product by MR.CARDBOARD, contact us by completing and submitting the form below. If you are looking for a specif part number, please include it with your message.